The symptoms of aerophobia can have a very strong effect on the biological and physiological processes of a person. This is especially true if the person has an underlying condition. Any anxiety or panic disorder can disrupt the usual functions of the body including those related to the heart and circulation.Anxiety can cause an increase in the release of adrenalin into the circulation resulting in a raised heart rate which in turn increases blood pressure. When the levels of anxiety increase to a panic the sufferer may experience palpitations meaning that they can feel their own heart beating in their chest and some feel that it loses its natural rhythm. This can be frightening and an unpleasant experience for the sufferer. For most otherwise healthy people, these symptoms are temporary and are not dangerous, for someone with an underlying heart condition or already high blood pressure the effects can cause further problems, especially if they are undiagnosed. If someone with a known heart condition is due to take a flight and are suffering with aerophobia, they should discuss it with their doctor long before the flight so appropriate considerations can be given to their medication. Anxiety and panic can lead to breathlessness, including short, sharp, shallow breaths or the person even holding their breath for long periods. A healthy individual will feel no long-term adverse effects of these symptoms and they should pass when control of the situation has been regained, but for those with existing breathing difficulties, these changes in respiration can significantly affect their overall health. Those suffering with asthma may need to use their medications more or at a greater dose, or those with lung disease may need supplementary help, perhaps using oxygen therapy. Anxiety and panic disorders can cause significant changes in the functions of the stomach and bowels. The colon can become temporarily paralysed causing changes in the normal function of the bowel. Sufferers normally experience either loose stools or constipation (though this is normally if periods of anxiety are prolonged). Nausea and vomiting are also both fairly common, so disturbances in gastric function are altered. Again this is not serious in those enjoying overall good health, but for those with existing bowel diseases or those with diabetes, effects can be very considerable and can exacerbate existing symptoms. 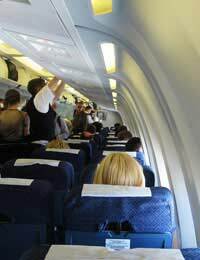 The time leading up to the flight can cause many effects on the person including loss of sleep, lack of concentration, muscular tension and general low mood and irritability. This can have effects of the muscular skeletal system, the nervous system and can significantly affect the social and professional status of the person with consequences on their normal day to day routines.Sweating may occur as can a dry mouth, these can both lead to not only dehydration, which can have its own nasty effects when travelling, but can alter the confidence and self-esteem of the individual. Effects on health and existing medical conditions can be dramatic when a person is suffering from aerophobia. These symptoms should always be taken seriously and appropriate preventative medicines and treatments should be sought from a qualified practitioner.